(BPT) - Growing up in Florida, Whitney Stewart never thought at any point in her life she would climb a mountain. That changed when she was 13 and took a trip with her local Boys & Girls Club to Colorado. At first she thought the mountains were just there to look upon, but then one of her Club staff members informed her she would be climbing one of those mountains. “I was thinking, I’m a Florida girl, I don’t do mountains,” Stewart recalls. Through the direction given to her by her Boys & Girls Club mentors, Stewart became a leader in both her school and community. Currently enrolled as a freshman at University of Pennsylvania, Stewart was recently given the honor of being named Boys & Girls Clubs of America’s 2015-16 National Youth of the Year. It’s hard to overestimate how much a mentor can impact a child’s life. Through guidance and a simple unwavering belief in young people, mentors can provide the guidance so many young people like Stewart need. In fact, a recent study showed that among Boys & Girls Clubs alumni, around two-thirds remember a specific staff member who made a positive impact on their lives. With nearly 4 million school-aged kids in more than 4,100 Clubs across the country, Boys & Girls Clubs of America‘s vision is that through providing a safe place for kids to go during out-of-school hours, all its members will graduate from high school with a plan for the future that is built on good character, citizenship, leadership skills, academic success and a healthy lifestyle. 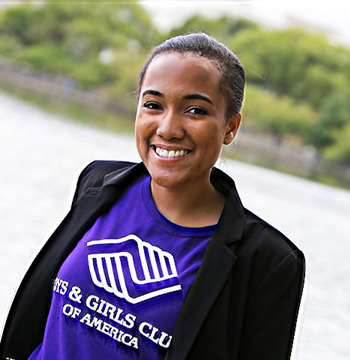 Today, it is estimated that one in every 16 Americans is a Boys & Girls Clubs alum. This has created a network of successful community leaders and professionals in every field, from lawyers and doctors to engineers, artists and entrepreneurs. In an effort to draw on the collective strength of this large network of alumni, Boys & Girls Clubs’ Alumni & Friends Club has been established in order to give former members an opportunity to reconnect, work together and give back to kids and families in need. It is estimated that there are more than 11 million kids in the United States who have no place to go after school. These kids lack simple, yet important things like safety and the guidance a mentor can provide. In response, thousands of alumni have taken the opportunity to help make a change by joining the Alumni & Friends Club. The goal of this alumni network is to keep former members connected and give them a way to foster hope and opportunity in a new generation. To join your fellow Club alumni, visit www.bgcalum.org and learn how you too can impact a kid’s life forever.